Judging by the energy of the 500 children gathered to attend the Steve Smith ProCamp last Friday, you never would have guessed it was 8:00 in the morning. Hundreds of kids and their parents lined up an hour before the camp was scheduled to start, decked out in what looked like every bit of Panther’s paraphernalia they had in their closet. By the time 9:00 am rolled around, most of them even had either black stickers or black paint stripes under their eyes. When a voice came over the announcer shouting “All the 7 year olds come on down to the field,” you might have thought a herd of cattle had just been let out on the bleachers. As they proceeded through each age group, stampedes of anxious, excited adolescents stormed onto the field at Ardrey Kell High School. For each of those kids, this camp was the chance of a lifetime to spend two days being coached by some of the best talent around and hang out with a few NFL pros, namely Steve Smith and Cam Newton. For us as sponsors of the camp, it was the chance to give back to the community and help send some of these kids, who might not otherwise afford the opportunity, to this incredible two-day program. Camped out in our tent behind the football field with the other sponsors, we were able to mingle with the parents, hand out a few giveaways and provide gallon after gallon of Gatorade to tired, thirsty parents and siblings. For many families that stopped by our tent, the mini bottles of sunscreen were the biggest hit, especially considering there was hardly a cloud in the sky the whole two days of camp. We also had a great time with our big giveaways; two autographed footballs signed by Steve Smith and the other NFL players in attendance and two bags full of football gear and training equipment. This obviously provided quite a draw and we registered hundreds of parents over the course of the two days. At the end of each day of camp, we toted our basket of registrants onto the field for Steve to pick a name. Both winners received a signed ball and bag of equipment, which made for two very happy families. With the winners of our Saturday giveaway! Sure, sponsorships are a great way to get FSIoffice‘s name out around town, but in this case it was about more than that. Being a part of this unforgettable experience for so many kids and helping provide that opportunity for them made the 7am setup and standing on your feet all day completely worth it. 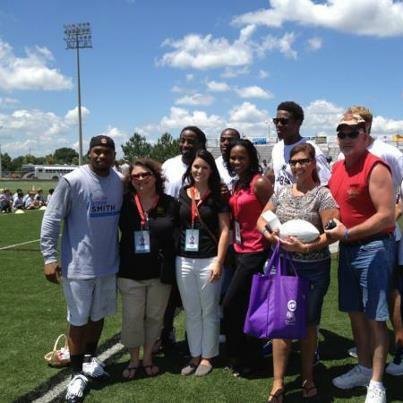 Not to mention having our picture made with a few NFL superstars. Previous Post: Help! I can’t find my file!